Abacoa Golf Club is one of the finest public golf courses in South Florida! 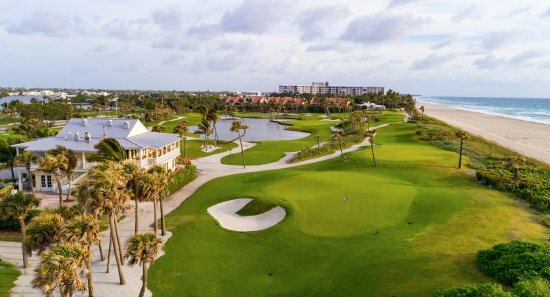 Designed by renowned course architect Joe Lee, Abacoa’s lakes and bunkers meet its sloping fairways with little obstruction, and you’ll find scenic views with 14 of its 18 holes surrounded by water. While challenging, this course is fair to golfers or all skills and experience levels! The greens are TifEagle grass, and the putting surfaces are of some of the highest quality in Florida. Treat yourself to a round at Abacoa! The Golf Club of Jupiter is a beautiful 18-hole course great for any level of skill. Test your accuracy with the fairways, water hazards and sand traps; they have everything you need to challenge you and improve your game. All in all, they will provide you with a quality experience that includes exceptional service and a comfortable atmosphere. Check out the driving range and the restaurant as well! Where else can you walk in the sea air, play an affordable 18 holes in two and a half hours, learn without frustration (or improve the most important part of the game), and be welcomed warmly no matter what stage of your golf “life” you’re at? No where else. Jupiter Dunes Golf Club is a little gem by the ocean. It’s a true haven for golf lovers and newcomers alike. Situated by the ocean on one of Jupiters natural estuary’s, the course was designed to replicate what you would find for a second shot on a regulation length course. This course is great for all! With a relaxing, picturesque backdrop, this course is challenging and will give you an unparalleled golfing experience. The Palm Beach Par 3 was redesigned by Hall of Fame golfer Raymond Floyd in 2009. It sits on 39 beautiful acres, both on the ocean and on the intracoastal. It was ranked in the top 50 Most Fun golf courses in the United States by Golf Digest Magazine in 2013. The Palm Beach Par 3 is a full service golf course, with 18 beautiful holes, a full length driving range, putting green and practice bunker. Located in the Tequesta area, Turtle Creek Club has become one of the premier golf destinations in South Florida! The golf course was originally designed by Joe Lee in 1969. It is appealing to the average golfer and still challenging to the highly skilled player. This is a wonderful golf course with a great membership to back it up. Since their reopening after extensive renovation in November of 2016, the “New” course has hosted sectional and local amateur and professional championships. Experience innovative golf design on their signature Jack Nicklaus designed 18 hole golf course! In 2006, the course was certified by Audubon as an environmentally friendly habitat. Using grasses developed specifically for the local climate, the course is consistently in tournament caliber condition. Special design features, such as deep pot bunkers, offer a uniqueness of appearance and a certain challenge to golfers who find themselves within their domain. The Signature Jack Nicklaus designed golf course is the centerpiece of its residential community with 285 homes set on 340 acres with over 71 acres of fresh water lakes and 40 acres of greenbelt. The club and community offer an intimate environment of casual elegance, uncompromising quality and unparalleled personal service, which is not only reflected in the golf experience but throughout the Activities Center, dining facilities, and custom services. More than a resort golf experience, PGA National Resort is a championship golf experience. PGA National offers championship golf courses with new turf, rebuilt bunkers, expanded tee and green complexes. Home of the Bear Trap and the Honda Classic. Jonathan’s Landing Golf Club is home to three challenging 18-hole championship golf courses, each with its own distinct ambiance. 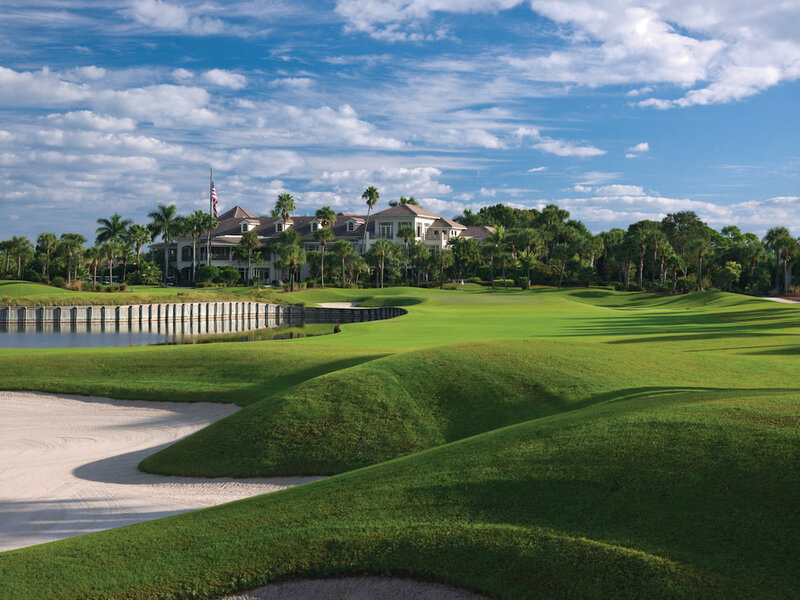 The Village Course, featuring a one-of-a kind ferryboat ride at the signature 17th hole, is one of two very unique JL courses designed by Tom Fazio. The second, known as The Fazio at Old Trail, has been described as one of Tom Fazio’s best designs and is considered the true championship course at Jonathan’s Landing. This award winning course is a true shot maker’s dream and offers stimulating play for golfers of all levels. With two 18 hole courses, water features and hills, a sightseeing bonus of an amazing tropical aquarium, drinks (alcoholic, too! ), burgers, and ice cream, Lighthouse Cove Adventure Golf offers fun for everyone in the family! Check this out for an awesome night out! Golden Cub Mini Golf in Downtown Abacoa is the newest place for family fun! This 18-hole mini golf course was designed by retired professional golfer, Jack Nicklaus. Golden Cub sells ice cream, beer and wine so the kids and the adults can cool off after a round of mini golf! And the best part… Golden cub donates $1 of every full price round of golf to the Nicklaus Children’s Health Care Foundation! Need a golf ready outfit before you hit the courses? Check out some of our fashion faves for a day of golf from Amazon below!